It was a very hot and challenging day at the Phoenix Kart Racing Association with the first day of racing for the 2018 Superkarts! USA Pro Tour SpringNationals. The temperature at the Glendale, Arizona facility rose to triple digits, reaching 103 degrees before the sun began setting in the west as the podiums were completed. The focus for everyone was staying hydrated and cool as possible. SKUSA offered up a cooling station, extra medical support, and water for all drivers after they got off the track. Prior to the Finals starting, a large dust devil swept the paddock, damaging a number of tents and on-track cameras which forced an hour delay. The day was dominated by a handful of drivers, with five earning sweeps to secure footholds into the championship chase. Kyle Wick became the third different driver on the year to win in the S1 Pro Stock Honda division. Wick (RPG / CRG) started out the day with the fast lap in qualifying (44.747), edging out Rory van der Steur (Tony Kart) by 87 thousandths of a second. Wick proceeded to lead all 15 laps of the Prefinal before going on to dominate the Final. After 25 circuits, Wick established a three-second advantage over van der Steur, making it a S1 rookie 1-2 finish. Last year’s SpringNationals winner Nic LeDuc (SodiKart) drove a solid third to complete the podium. Billy Musgrave (MRC / Aluminos) recorded fast lap of the race in his fourth place finish, with Kol Bailey (LEM / Praga). 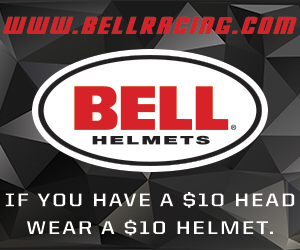 Two-time defending champion Ryan Norberg (PSL / Birel ART) landed his first victory of 2018, making it three straight years with a victory at the SpringNationals. Norberg began the day with fast time in qualifying (46.303). Rolison Performance Group / Kosmic teammates Samuel Lupien and Hannah Greenemeier were second and third, all within 57 thousandths of a second. Norberg held off a late charge by Lupien in the Prefinal for the win. In the 25-lap Final, Norberg broke away from the field with 2014 champion Jake Craig (RPM / Tony Kart) and Lupien trailing, never changing positions to the checkered flag. Christian Brooks (Nash / CRG), carrying the #300 to honor the passing of fellow racer Mason Marotta, climbed from 13th to fourth with Dante Yu (J3 / CompKart) placing fifth. Hard charger of the race was rookie Trey Brown (Nash / FA Kart), who wrecked in the opening lap of the Prefinal, knifing his way from 39th to 10th. Pedro Lopes made it three straight in his Pro Tour debut season in the S2 Semi-Pro Stock Honda category. Lopes (RPG / Kosmic) swept the day’s action to earn maximum points on the day to extend his championship lead. 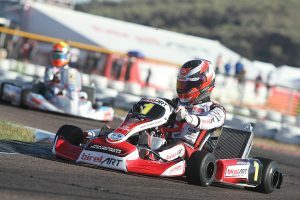 Michael Ilavia (3G / Birel ART) grabbed the holeshot at the start of the Final, however, Lopes ran him down and continued on to win by over five seconds. Ilavia settled for second, his first Pro Tour podium in the category. Cameron Egger (RPG / Kosmic) climbed from the back of the field after a DQ in the Prefinal for a detached bumper to end up third, slipping past Max Hewitt (Alpha) and Blair Hosie (Alpha). 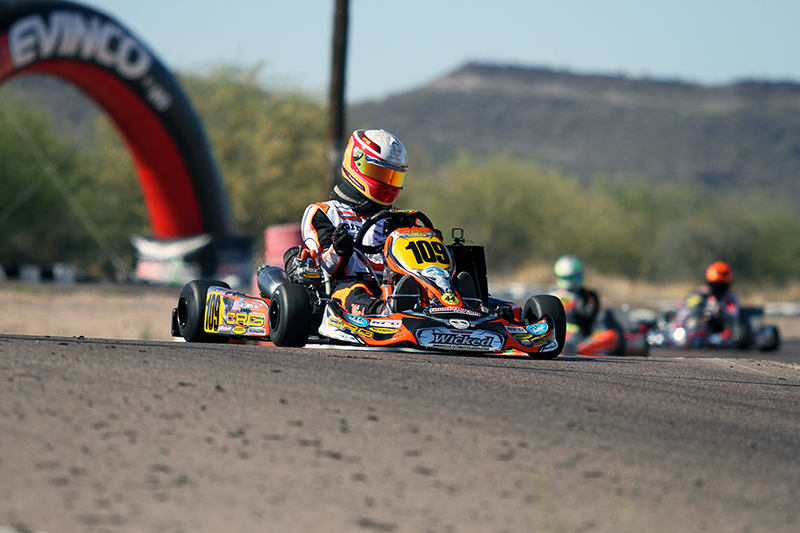 Pedro’s brother Paulo Lopes earned his first SKUSA Pro Tour victory in the X30 Master division. Paulo (RPG / Kosmic) entered the weekend as the championship leader thanks to his two podium results at NOLA. Everyone however was chasing Leonardo Nienkotter (J3 / CompKart) for much of the day. Nienkotter set fast time in qualifying and walked away with the win in the Prefinal. The three-time SuperNationals winner established a solid lead, however, Lopes was able to run him down in the second half of the race. With two laps remaining, Lopes made a bold and deep passing move on Nienkotter, catching him off-guard. The move was enough to give Lopes the lead and enough room to cruise to the checkered flag. Travis Irving (FW / CompKart) was a close third with Vatche Tatikian (PGR / Ricciardo) fourth and defending two-time champ Derek Wang (RPM / FA Kart) fifth, earning fast lap of the race. Defending S4 Master Stock Honda champion Jordon Musser dominated the day for his first victory of the season. Musser went unchallenged in both the Prefinal and Final, leading each and every lap. Championship leader Ryan Kinnear (DKC / SodiKart) was second with Kiwi Nathan Stewart (DKC / SodiKart) right on his bumper in third for his first SKUSA Pro Tour podium. Terry Lawrence (LEM / Formula K) and Vivek Tandon (DRT / DR Kart) completed the top-five. John Crow matched the performance of Musser in the S4 Super Master Stock Honda category. Crow (MRC / Aluminos) was untouched throughout the day, and began with the overall fast lap in qualifying, posting a time quicker than Musser. Crow led all the laps in the Prefinal and Final, however, he was trailed by Rod Clinard (CRG Nordam) in the Final through the entire 25-lap distance. Victor Jimenez (RPG / Tony Kart) completed the podium with Mike Jones (DKC / SodiKart) fourth and Ken Schilling (Aluminos) fifth. The X30 Junior class was the first on the order for the day with a full 44-kart field. Arias Deukmedjian (LEM / Tony Kart) was able to come away with victory on the day. Deukmedjian started the final in the fifth position behind Prefinal winner Tyler Gonzalez (SCR / Tony Kart) and top qualifier Jonathan Portz (Nash / FA Kart). Gonzalez, who jumped out to a solid lead in the Prefinal, did the same thing in the Final. This time, Arias and Tyler Maxson (CRG Nordam) were able to run down the 2016 SuperNationals winner. On lap 16, Deukmedjian took the lead with Maxson following through to take second from Gonzalez. That was the deciding move, as Arias crossed the line first for his first SKUSA Pro Tour victory over Maxson and Gonzalez. 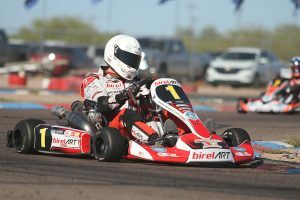 MacKenzie Clark (Prime / Birel ART) climbed 14 spots to finish fourth ahead of championship leader Matheus Morgatto (Parolin). Hard charger went to Pedro Aizza (RPG / Kosmic), up 29 spots to 12th. 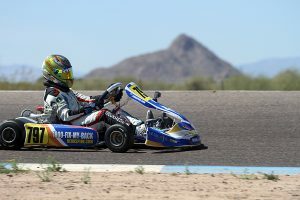 Carson Morgan showed why he is the defending champion in the Mini Swift division, earning another SKUSA Pro Tour victory. Morgan was able to hold off the challenges of a strong field, earning the win in the Prefinal before fighting off Kai Sorensen (Benik) and Noah Baker (Energy) in the Final. 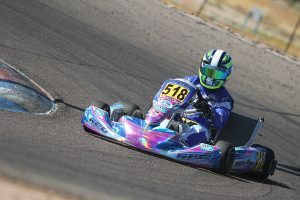 The win for Morgan was the first for a Kart Republic chassis in the Cadet ranks here in the United States. Alex Powell (Energy) was fourth with top qualifier Jack Jeffers (Benik) up seven spots to fifth after a tough Prefinal. A second victory on the year went to Caleb Gafrarar (Parolin) in the Micro Swift class. Gafrarar was able to fend off great challenges by Danny Dyszelski (Parolin) and top qualifier Max Garcia (Benik). Gafrarar won the Prefinal over Garcia while Dyszelski was the top challenger in the Final. It was a close finish, with the two crossing the line separated by just 83 thousandths of a second. WinterNationals winner Ben Maier (Nitro Kart) struggled early but bounced back to finish fourth with Andres Cardenas (Tony Kart) in fifth.